Label is a component in AWT package. It is used to display non-editable text on the window. You can create a label by using the Label class. The Label class is summarized below. creates a label object without any text on it. creates a label object with text on it. creates a label object with text on it and the text alignment is specified. reads text from the label object. sets the text alignment of the label object. sets the text of the label object. sets the text color the label object. sets the font of text of the label object. In the example code about, a label object called lbl is created without specifying its text and with the default alignment. 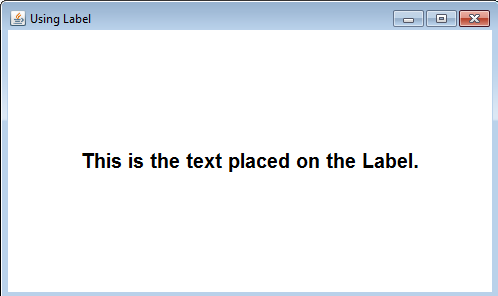 The the setText method is used to set the text of the label. Its setFont method is used to set a font object to text of the label. The syntax to create a font object is Font f=new Font(Font_name, Font_style, Font_size). To specify that the text of the label must be left aligned, you need to use the setAlignment method. This method accepts a constant value Label.LEFT, Label.RIGHT, or Label.CENTER. If you supply Label.LEFT to this method, the text of the label will be left aligned. By supplying Label.RIGHT, the text is right aligned and so son.